I didn't go see my mom yesterday, because I wasn't feeling good, and because my aunt said that my cousins might come see my mom today and bring the baby, so I decided that obviously I was meant to stay home yesterday, and waited till today to go instead. 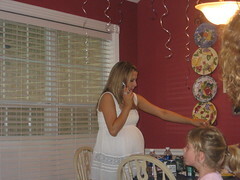 The picture is from last spring, and this is my very pregnant cousin Brittany - she's my first cousin once-removed, technically, I guess, because her mom is my first cousin - and I hadn't seen them since her baby was born in August. I'm not a person who goes all ga-ga over babies, in general, but this one is adorable. I wish I'd had my camera. She's 3-1/2 months old, and she isn't the most beautiful baby I've ever seen, really, but she's very, very cute, and very sweet-natured. She'd make a good elf, I was thinking - all she needed was the pointy ears. My mom seems somewhat better, again, I think. Today she was talking a good bit better - still not getting around too good, but certainly not any worse, there, either. We did go to see Casino Royale yesterday - even though I wasn't feeling good, I figured I could stand to drive 5 minutes down the road and sit in the movie theater for a couple of hours! We started to go see Blood Diamond, originally, and then we got to looking at Rotten Tomatoes and well, the Bond movie was winning pretty convincingly there. (It had 95% positive reviews and the other one had really iffy ones - it seemed to be one of those love it or hate it kind of things, with plenty of votes on the "hate-it" side.) Rob doesn't usually like Bond movies, but the reviews were enough to convince him to go, and I think he did like it. I did too. I was never a big fan of the crazy pseudo-high-tech school of Bond movies, but this low-tech, semi-realistic Bond I can get down with. (It is still an action movie, it's not like you expect things to be perfectly realistic.) And while Daniel Craig isn't any Pierce Brosnan in the looks department, he's not really hard on the eyes, either. Those blue eyes, mmm.